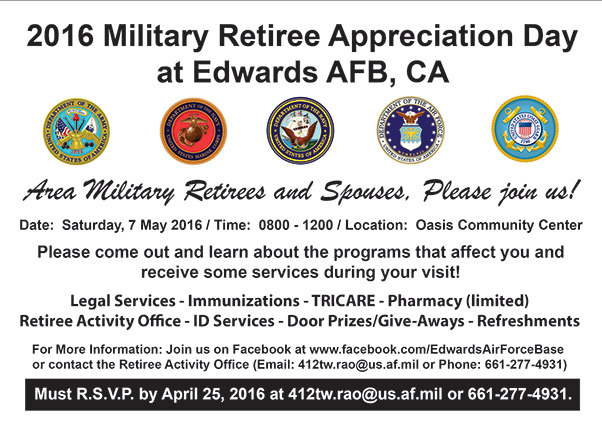 Edwards AFB will hold its 2016 Military Retiree Appreciation Day May 7. The event will be 8 a.m.-noon at the Oasis Community Center in Bldg. 2500 at 205 West Popson Ave.
After the opening ceremony, attendees will have the opportunity to visit a variety of informational booths and attend breakout sessions to obtain information and some services of value to retirees. 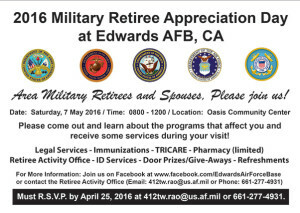 The Edwards pharmacy, immunizations clinic personnel and legal office will be there to serve the retirees along with the Edwards Retirees Activities Office and TRICARE representatives. I.D. services will also be available. Invitations will be mailed out to local retirees. Those who receive the invites are asked to R.S.V.P. by April 25 in order to ensure sufficient accommodations. Refreshments, gift bags and door prizes will also be provided to make Retiree Appreciation Day 2016 both fun and informational. 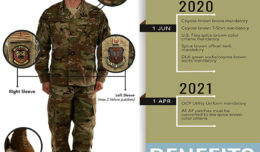 For more information or to R.S.V.P., call 661-277-4931 or email 412tw.rao@us.af.mil. 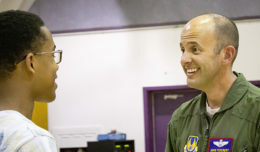 Information is also available at www.facebook.com/EdwardsAirForceBase.